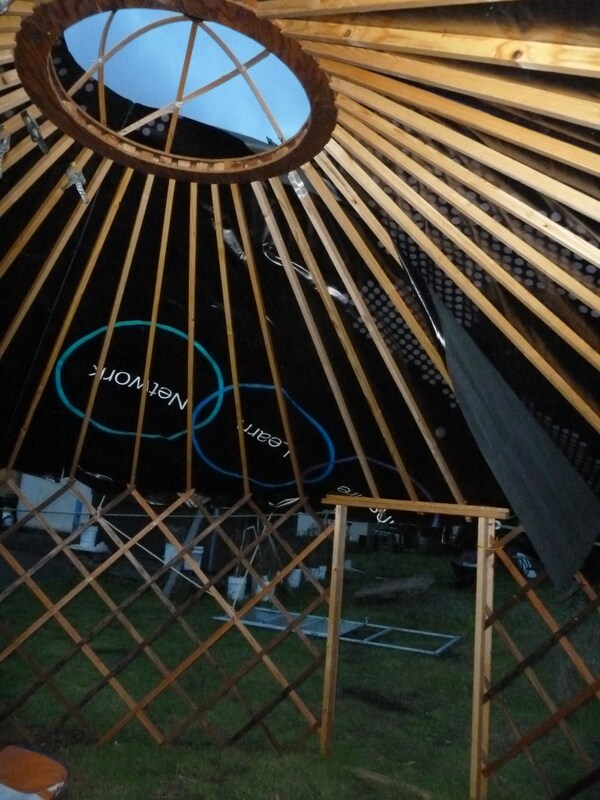 Progress on the yurt continues. Much of the progress is imperceptible to anyone but myself but the progress is there. As it turns out, my initial suspicion that my first yurt would be a prototype for working the kinks out of the design turned out to be true. So let me share what I've discovered so far. 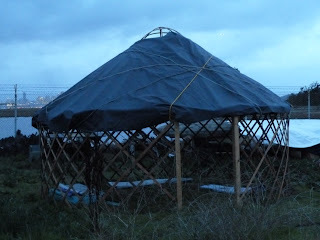 I got the crown on the central ring of the yurt. I used some kayak rib stock, 1/4 inch by 3/4 inch white oak, socketed into the central ring and lashed together with tarred seine twine. The idea behind the crown is that it will be open under normal conditions but covered when it is raining or heat needs to be kept in the yurt. 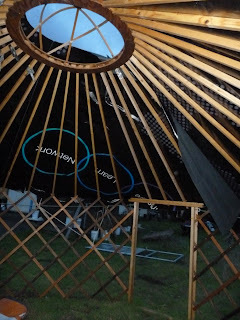 Another discovery I made after the initial assembly of the yurt was that for the sake of getting a good setup it helped to trace a circle on the ground first before erecting the walls so that the walls would form a perfect circle. 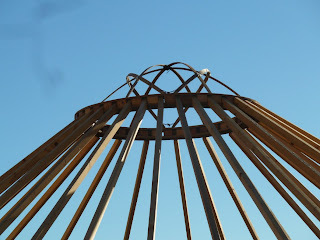 The perfect circle is essential so that all the rafters are the same distance from the central ring. I also discovered that I had much more wood in the central ring than I needed and so it was too heavy and difficult to get into position when no help was available. What I did to remedy the weight problem was to cut some of the extra wood away from the center of the ring. It was way stronger than it needed to be. The next step was to cut out some fabric for the roof. It took me some time to work out the trigonometry for the roof cover shape, but I did it. But I have learned to distrust theory and test with an actual life size cover. The other reason for getting the cover in place was that a series of rain storms were coming into the area and that would be a good test to see how the cover would stand up to the wind. Here's an inside shot of the cover. The wind lifted it some and pushed it off center. Part of the problem is that the shape of the cover is like a pie with a wedge cut out of it and the edges adjacent to the missing wedge get pulled together and glued or sewn resulting in the desired pyramidal shape. The cover is made out of some sort of vinyl covered fabric that is used for advertising banners. A friend gave me a bunch of these banners and I cut them up to fit the roof. The fabric has two problems. One is that it is very heavy and the other is that it is very stiff. The combination of weight and stiffness makes it very difficult to pull this stuff up on the roof. The weight also works against its portability. On the plus side, the cover survived the storm and did not get blown off. I also discovered that once again, there is nothing like building something to test a design because until you do, it's next to impossible to know what sort of problems the design has. So far, none of the design elements have been complete failures but lots of them can use improvement. The wall battens are slightly too flexible. A bit more stiffness is advisable even at the expense of greater weight. The skin is too stiff and heavy. Lighter weight is advisable. Other commitments have kept me away from the yurt, but the learning continues. I will continue to post whenever there is progress or even when design ideas fail.